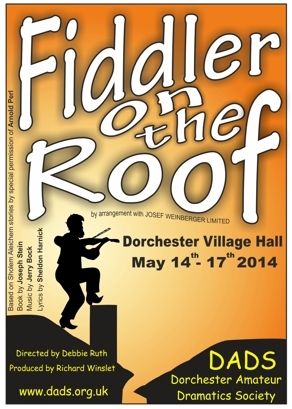 This was a triumph of a performance by Dorchester Amateur Dramatics Society which played to packed, appreciative audiences. 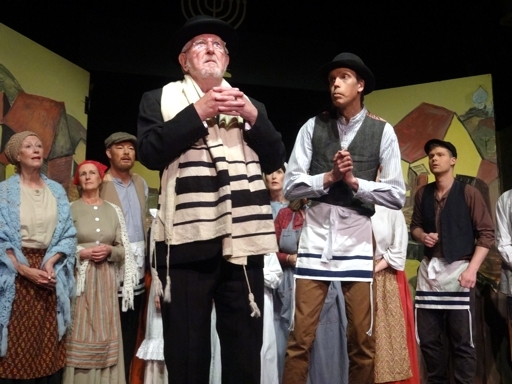 With the solitary melody of The Fiddler, Annabel Cotton, the musical opens in a small Jewish settlement in Anatevka in Russia in 1905, with persecution of the Jews taking place and the Russian Revolution just round the corner. 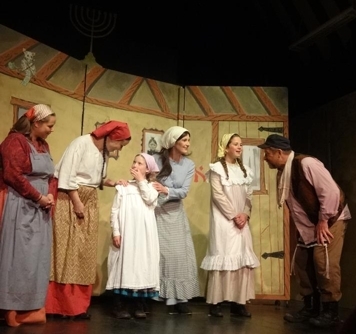 The poor milkman, Tevye, and his wife, Golde, try to find husbands for their three marriageable daughters in accordance with their established traditions, but the girls want to marry for love rather than traditional obligation or financial security. 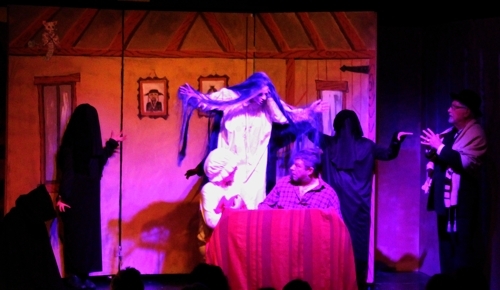 Tevye is torn between his religious beliefs and his daughters’ happiness. 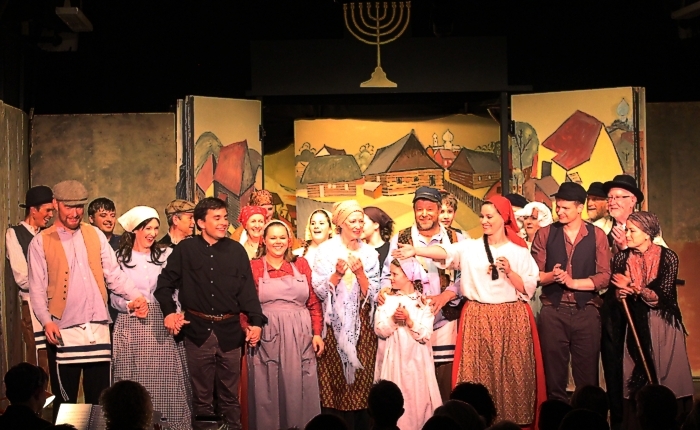 Tevye finally gives his blessing to his two eldest daughters, Tzeitel and Hodel, but struggles with his third daughter, Chava, who wants to marry a Russian. Whilst the storyline is sombre, the play is full of glorious songs that we all know, enthusiastic performances and many truly funny moments. The lead performers were excellent and at the centre is Tevye with John Cornelius giving a spectacular lynchpin performance. His wonderful voice, whether singing or talking, commands attention and his charisma is infectious. He carries the role of an impoverished put-upon father very well, always ready with a quote from the Bible, and his remonstrations with his God were a joy to watch. It is not easy to hold your own as the partner of such a strong character and Ann Winslet was a revelation in her portrayal of Golde. She was both the dutiful wife and the powerful matriarch and they achieved a balance which allowed the audience to relate to them on many levels. Particularly heart warming were their duets, with Do you Love Me? bringing knowing smiles to many faces in the audience. Rosemary Mills showed her fine versatility as a character actor by playing the village matchmaker, Yente, as an old crone who struggles to find suitable matches for the daughters. The three marriageable daughters Tzeitel, Hodel and Chava, were outstandingly played by Catherine Paul, Rachel Winslet-Morris and Sarah Gladwin; all three having wonderful singing voices. The two youngest daughters Shprintze and Beikle, played by Ella Forman and Rosemary Paul completed the family and it was really good to see such young actors creating a wholly believable family unit. Their rendition of Matchmaker was particularly well done. The main male roles were also strongly performed. Jim Levi as the butcher, Lazar Wolf, was excellent. He and John Cornelius delivered the inn scene, where they are at cross purposes discussing the prospective marriage to Tzeitel or the sale of a cow, with crisp comic timing. The three suitors for Tevye’s daughters, Motel the bumbling tailor (Mark Wilkin), Percheck the ardent student (Johnny Cornelius) and Fyedka the hansome Russian (Victor Moynot) created wholly believable characters, and the Constable (James Hoyland) was both suitably menacing and sympathetic at the right time. 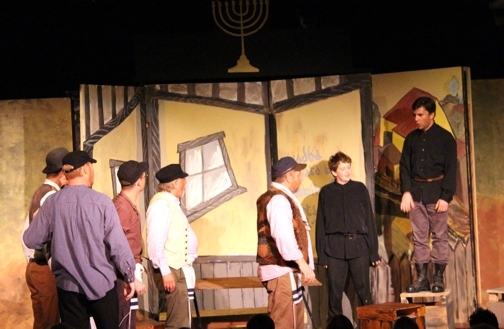 The Rabbi (Mike Selway) and his son Mendel (David Fardon) proved to be a good comic duo. It should be noted that all the beards were real, grown for the occasion, with no danger of stuck-on whiskers falling off! The choreography ably dealt with the limitations of a small stage and the Director, Debbie Ruth, moved her players, both principals and chorus, to create well orchestrated set pieces which gave a clear picture of life in a small village. Michael Herbert and Adrian Brooks had designed a beautiful village set and the integration of Marc Chagall imagery, created by Adrian Brooks and Mari Metcalfe, worked well. Clever use was made of props, particularly in the The Dream. The dream sequence was Tevye’s trick to get Golde to agree to let Tzeitel marry the poor young tailor, Motel, rather than old Lazar Wolf. It was well staged and performed, working both as a big set piece and demonstrating the power of superstition combined with tradition. The Producer, Richard Winslet, the Director, Debbie Ruth and the Musical Directors, Angie Paterson and Russell Leigh should all feel suitably proud in bringing such a fine performance to the stage in Dorchester.